Removing paperclips from archival collections. Often a daily chore. 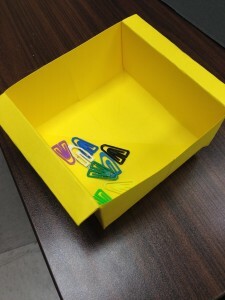 Why leave them scattered on the table when you can origami yourself a handy box? My favorite box tutorial comes from the Netflix Origami folks. It’s designed to work with a netflix DVD mailer tab, but works perfectly with an 8.5 x 11 inch piece of office paper. It’s easier than a paper crane and basically free. Highly recommended to add to your processing arsenal.